#24867 Combination Car made in 1958 & 1960. #24869 Coach Car made in 1958 & 1960. #24868 Observation Car made in 1958 & 1960. #20178, the 1959 promotional set, with two engines, the #21160 Atlantic steam engine and the #21813 M&StL Baldwin. 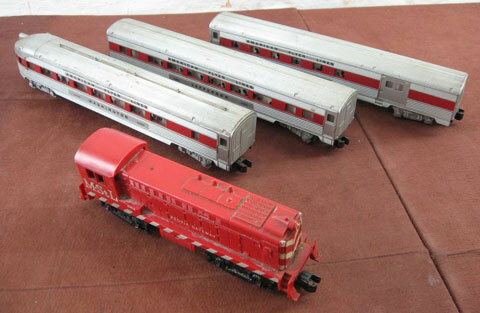 In addition to these three red-stripe streamliners, the set included the #24403 Illinois Central reefer, #24309 Gulf tank car, and #24603 AFL caboose. #20181, the 1960 mail order set #1, had the same engines with these three red-stripe streamliners, plus the #24403 Illinois Central reefer, #24322 Gulf tank car, #24203 B&O hopper, and #24627 AFL caboose. 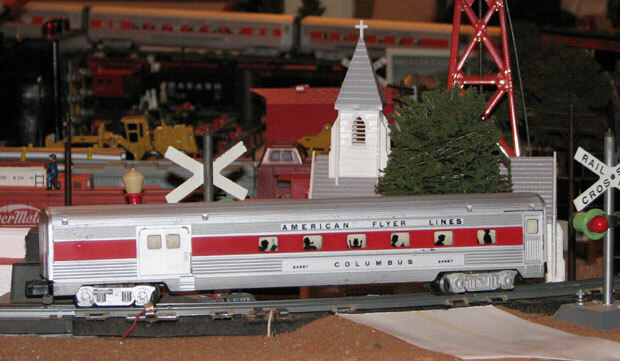 #20193, the 1960 special set, teamed the #21813 M&StL Baldwin engine with these three red-stripe streamliners.